Voot Silsila Mishti and Ruhaan come closer while he helps her in tough tasks. She prefers to manage all her work on her own. Ruhaan knows that she is independent and doesn’t need help, still he can’t stop himself finding her in trouble. She gets afraid of the stove fire and hugs Ruhaan. Ruhaan wants to know if she is fine. She thanks him for his help. She sees his sensitive side. He asks her not to see everything as right and wrong, few things can be in the middle too. He advises her not to control Ansh, else he will become a rebel. He tells her that every guy will do the same in the teenage phase. He finds Ansh’s mistakes normal. He is happy that she took a right step to protect Pari, but asks her to give some freedom to Pari to handle her own problems. He understands her concern and asks her to show some belief in Pari. He tells her that she can’t be with everyone all the time, since she will be leaving after marriage. He asks her to make her siblings independent and give them a chance to become bold. Mishti likes his sensible talk. He apologizes to Mishti. On the other hand, Arnav is broken down because of Pari’s confession. Sukamini asks him not to let Pari go away and make her realize his love. She advises him to win Pari’s love. Arnav tells her that his love is unconditional. He doesn’t think its Pari’s fault. He wants to bear all the pain for the sake of her happiness. Sukamini finds him very clean hearted and deserving of Pari’s love. She tells Arnav that he can still have hopes, he can still get a chance if Ruhaan turns down Pari’s love proposal. Mishti comes to Veer’s office to meet him. Veer stays busy in his meeting. She tries to finish the meeting early, but fails. Mishti misunderstands Veer and thinks he is avoiding her. Sukamini asks Arnav to become independent, so that Pari can like to settle with him. She guides him and asks him to become responsible. Arnav likes her advice. Pari comes to meet Arnav. Arnav thinks its better to avoid her. Sukamini asks him to face her. He doesn’t want Pari to hurt his feelings more. Sukamini lies to Pari that Arnav isn’t home. She feels bad for Arnav, who didn’t cope up with the heartbreak yet. 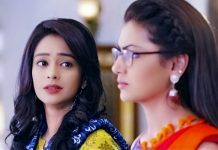 Pari wants to end Mishti and Veer’s issues. She thinks to take help from Ruhaan. She asks Ruhaan to talk to Veer and explain him. Ruhaan feels he can’t get between Veer and Mishti’s personal matters.